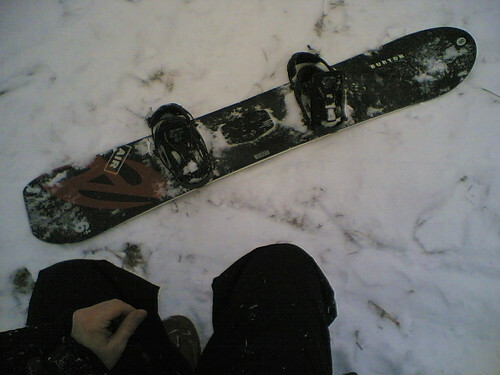 Sunday morning, around 7 AM… I couldn’t sleep, so I got up, suited up, and went out snowboarding. The local ski/snowboard hill doesn’t even open until 10AM, so I just found a local sledding hill (which was empty at 7:30 on a Sunday morning.) Now, I’m still pretty much a beginner, so a small-to-medium sized sledding hill is all I need to keep me busy for a while. I think I lasted under an hour. Going down the hill is no problem, that’s the easy part… The hard part is hiking back up the hill. It also started snowing pretty heavily, so the stupid eyeglasses were getting foggy and snow-covered. Still, it was a lot of fun, and I’ve scoped out about 3 or 4 other hills in the area to try out. Luckily, we’ve got a good amount of snow now, and it should stick around until March if we’re lucky. Yay snowboarding! Posted on Sunday, January 21st, 2007 at 9:30 pm. Subscribe to the comments feed. Both comments and pings are currently closed. Post on your own blog.